The battalion was originally activated in April 1911 as the 1st Battalion, 4th Marine Regiment. The battalion first saw combat action in November 1916 in the Dominican Republic where the men of the battalion bravely fought and where 1st Lieutenant Ernest Williams was awarded the battalion’s first Medal of Honor. The mission in the Dominican Republic was to protect foreign lives and property and to provide the “muscle” for a military government whose strategic goal was to bring stability to the troubled island republic. In 1924, the battalion returned to its home base in San Diego, CA. During 1926 to 1927 the battalion guarded American shores in a variety of outposts throughout the Western U.S. In the spring of 1965 the battalion deployed to combat in South Vietnam. From 1965 to 1969 the battalion engaged in numerous conventional and counter-insurgency operations in the I Corps. Some of the major operations that 1/4 was involved in were Operation Prairie, Operation Prairie lll, Operation Prairie IV, Operation Beacon Hill, Operation Desoto, Operation Deckhouse, Operation Kentucky, Operation Purple Martin and Operation Napoleon Saline ll would be fought from places such as the Rockpile, Camp Carroll, Con Thien and Ca Lu Combat Base. In October 1969 the battalion would serve from Okinawa and also off the coast of Vietnam. The battalion participated in the evacuations from South Vietnam in April 1975 and the rescue of the SS Mayaguez in May 1975. The terrorist’s attacks on 11 September 2001 began the battalion’s campaign in support of the Global War on Terror. In March 2002, as part of the 13th Marine Expeditionary Unit (MEU) Special Operations Capable (SOC) the battalion served as a reserve force, for Operation Anaconda, and others, in support of the initial combat operations in Afghanistan. In March 2003 the battalion was part of the initial ground invasion in support of Operation Iraqi Freedom. The battalion fought its way through Iraq conducting combat operations in the cities of An Nasiriyah, Al Kut, Ah Numinayah, Abu Garaf, Hasan Al Hamzah (where Bravo Company lost Private First Class, Juan G. Garza), Ah Shatrah, Saddam City (Later Revolution City and Sadar City), Qalat Sakar, Al Hillah, Al Hayy, and Bagdad. In May 2004, the battalion with the 11th Marine Expeditionary Unit (MEUSOC), the battalion again returned to combat in Iraq for a 9-month deployment, which was highlighted by a major victory against insurgent forces in Najaf, after the fighting at Najaf cemetery, Bravo Company guarded Abu Ghanrib prison and supported Operation Phantom Fury. In 2005 elements of the battalion supported Hurricane Katrina disaster relief efforts in Mississippi and Louisiana. After the Hurricane relief, in 2006, the battalion deployed on the 11th Marine Expeditionary Unit (MEUSOC) in support of the Western Pacific Deployment and conducted training in Kuwait in support of OEF 6-7. From 2007 to 2009 the battalion conducted two more tours in Iraq, supporting Operation Iraqi Freedom. In Spring of 2007 the Battalion deployed to the Iraqi province of Al Anbar conducting operations in Al Qaim region, centered around the cities of Husaybah, Rawa, Ana. The Battalion conducted thousands of mounted and dismounted combat infantry patrols, ensuring that the population was able to conduct business, travel and move around freely in a secure environment. In addition, the Battalion was also tasked with training the Iraqi National Police and Iraqi National Army on counter-insurgency tactics and techniques. In the Fall of 2008 the Battalion again deployed to Iraq province of Al Anbar, conducting combat and counter-insurgency operations in the war-torn city of Fallujah and outlying districts. The battalion would be one of the last infantry battalions of Marines to conduct combat operations in Iraq. 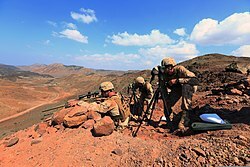 In May 2010 the battalion attached to the 15th Marine Expeditionary Unit (MEU) in support of the Western Pacific deployment. During this deployment, the battalion executed the first anti-piracy in the Marine Corps in over 200 years by capturing the pirated motor vessel, Magellan Star. In February 2013, the battalion attached to the 13th Marine Expeditionary Unit. 1/4 Completed a Marine Rotational Force-Darwin deployment after returning from the 13th MEU. 1/4 is the Battalion Landing Team attached to the 11th MEU, augmented with attachments including: a tank platoon, artillery battery, LAR Company, AAV Platoon, and CEB platoon. ↑ "Marines have arrived in Syria to fire artillery in the fight for Raqqa". The Washington Post. 8 March 2017. https://www.washingtonpost.com/news/checkpoint/wp/2017/03/08/marines-have-arrived-in-syria-to-fire-artillery-in-the-fight-for-raqqa/. Retrieved 9 March 2017. ↑ United States Army Center of Military History, "Medal of Honor Recipients - WWII", Available online at "Archived copy". Archived from the original on 16 June 2008. https://web.archive.org/web/20080616211621/http://www.history.army.mil/html/moh/wwII-a-f.html. Retrieved 2008-06-10. Cited 18 September 2009. ↑ United States Army Center of Military History, "Medal of Honor Recipients - Vietnam", Available online at http://www.history.army.mil/html/moh/vietnam-a-l.html Cited 18 September 2009. ↑ 1st Battalion, 4th Marines, "Battalion Honors", Available online at http://www.i-mef.usmc.mil/DIV/1MAR/1BN4/honors.asp Cited 18 September 2009. Accessed 18 September 2009. Archived 25 September 2009.